Photos by Rachel Von | The Journal Gazette Bob King became enamored with fishing through his father, who also supplied him with his first fishing lures. King says he once had thousands of lures but has cut back over the years. 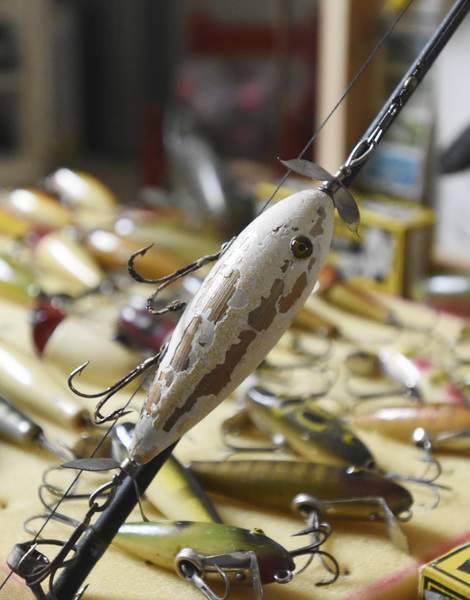 Rachel Von | The Journal Gazette Bob King's collection of fishing lures in his home in Ossian, IN on Thursday November 15, 2018. King is able to share his love of fishing lures as a member of a local collectors club. This once-a-month feature profiles northeast Indiana residents who are age 70 and older. If you would like to submit a senior for possible publication, email Terri Richardson at trich@jg.net. Bob King loves to fish. Actually, that's probably putting it too simply as fishing seems to be a big part of who King is. The 71-year-old Ossian man has been fishing since he was young, spending a great amount of time on the water with his father. He also fished with his grandmother, who lived at a lake. “(My) grandmother had the real patience,” says King, teaching him to tie knots and other things. King and his father also went fly fishing. He still has his father's old bamboo rod. It was also because of his dad that he got involved in another fishing hobby – collecting lures. His father retired them and put them in his tackle box, opting to buy newer ones. But King didn't forget about them. In his late 20s, King says he asked his father if he still had those lures. He did, so King cleaned them up and put them back in the tackle box. At the time, King didn't know there was a fishing lure collectors group until he went to Shipshewana and met a man who collected them. “From there it progressed,” King says. 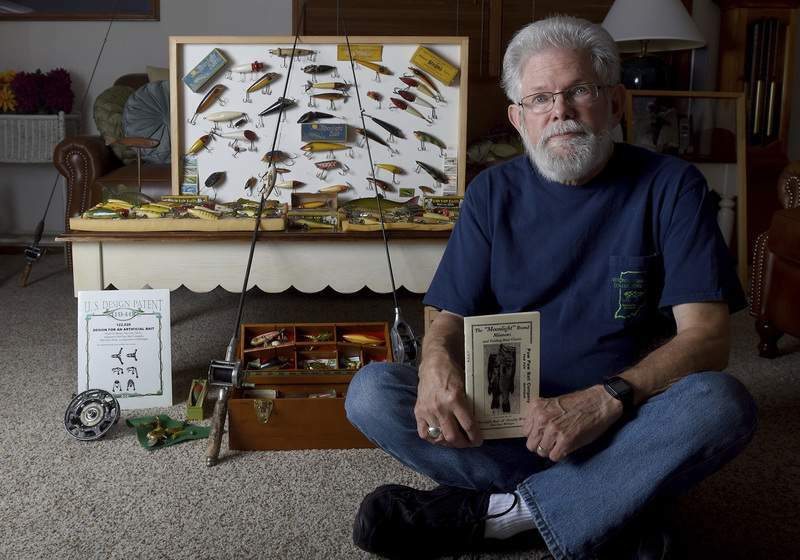 He is a member of the Fort Wayne chapter of the National Fishing Lure Collectors Club and has been for about 35 years. 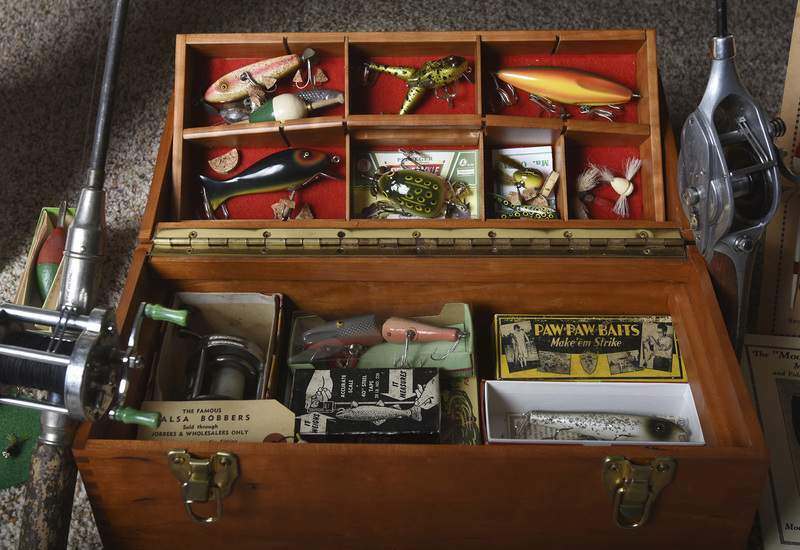 At one time, he says he had a few thousand fishing lures. However, he has trimmed that collection down the last 15 to 20 years. He keeps his favorite ones in a 36-inch long case with a Plexiglas cover on it. King uses another tackle box for his other lures. He currently likes to collect Paw Paw and Moonlight lures from the Moonlight Bait Co. in Michigan. He says some lures are rare and can command thousands of dollars. However, he says it has gotten harder to find lures as most people are unwilling to sell or trade. “Nobody wants to trade because they don't want to give up what they have,” he says. It used to be that a collector could go to garage sales and flea markets and find a number of lures. But as the years passed and home decorators got into using fishing equipment to decorate, the prices started to go up, King says. 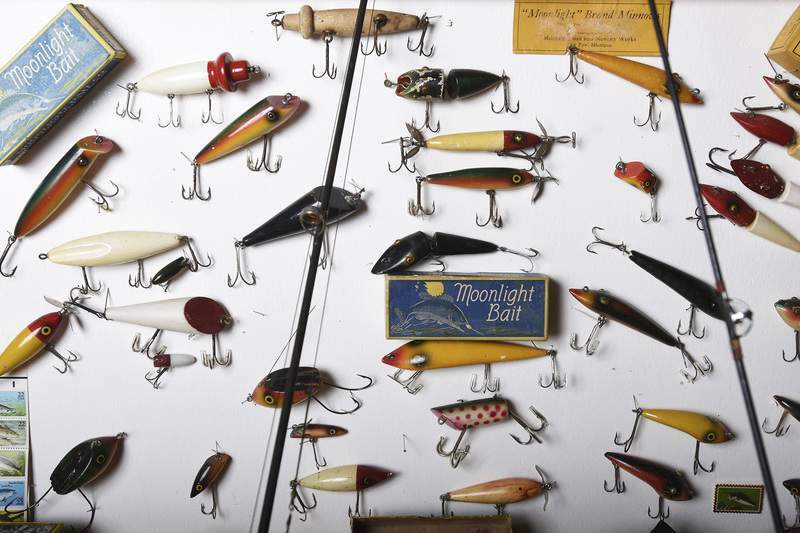 When the internet came along, the hobby of collecting fishing lures exploded. “You can find fishing lures all over the world,” King says. Most people don't know that this area in Indiana was actually a hotbed for fishing lure manufacturers, King says. There was the Creek Chub Bait Co. in Garrett, which made handmade, hand-painted wooden lures, as well as the South Bend Bait Co. The Creek Chub Bait Co. went out of business when plastic lures became popular. King says the newer fishing items are definitely easier to use. He practices a new technique that uses a Ned Rig Worm, which is a rubber worm with a lead head. “Best fishing ever using that,” says King, adding that he has caught 50 bass using the lure. However, King practices catch and release so the only thing to prove it is photos and fish stories. King also enjoys passing along his fishing knowledge to his five grandsons. While not all of them are into fishing, King says the 14-year-old is a member of the collectors club and the 8-year-old is coming along in his fishing. But King, who retired from Verizon, does do other things than just fishing. He and his wife play pickleball in the morning. His wife is not a fishing person, but she is a huge help with the collectors club's shows and conventions, says King, who is gearing up for the national convention, which will be in Fort Wayne this year.